Literary it means "My honour is called loyalty" but the meaning is closer to "My honour is loyalty". The Motto comes from Hitler's letter to SS kommendant Kurt Daluegelle in 1931. There was sentence-ending "...SS-man, your loyalty is your honour" and Heinrich Himmler took that sentence from letter and came up with that motto. That motto is forbidden and punishable by law in Germany and Austria even today. 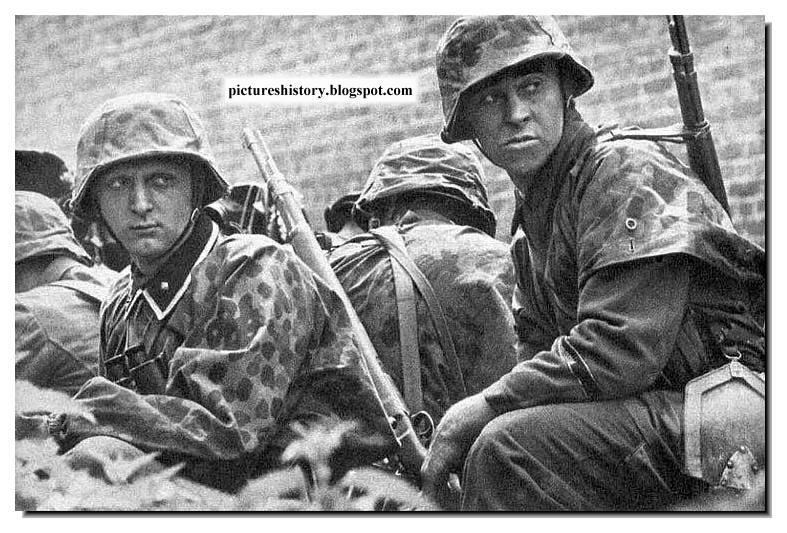 The best Waffen SS Divisions were Liebstandarte and Das Reich, along with Totenkopf. 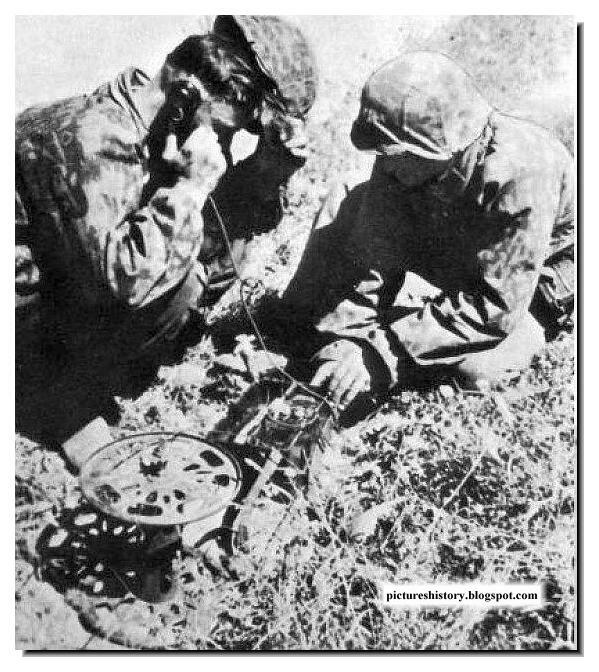 In other words the 3 divisions that made up the II SS Panzer Korps. Up until mid 1944 they could be considered as elite status divisions and were well regarded by German commanders as 'fire brigade' formations. In other words, formations that could be reliably used to plug holes and prevent Soviet breakthroughs. The Totenkopf were certainly not just fancy concentration camp guards. 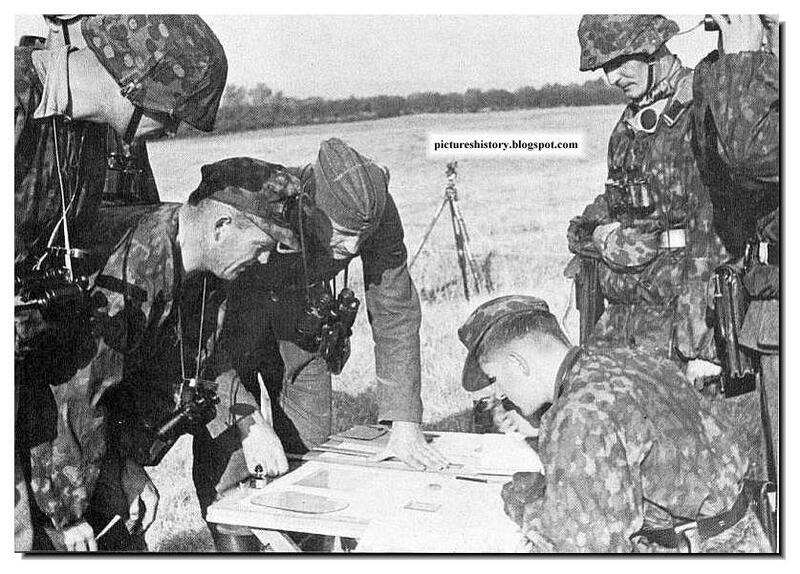 As part of II SS Panzer Korps they formed the main offensive wedge of 4th Panzerarmee at Kursk, and along with the other two SS divisions achieved the furthest penetration of any German formation. 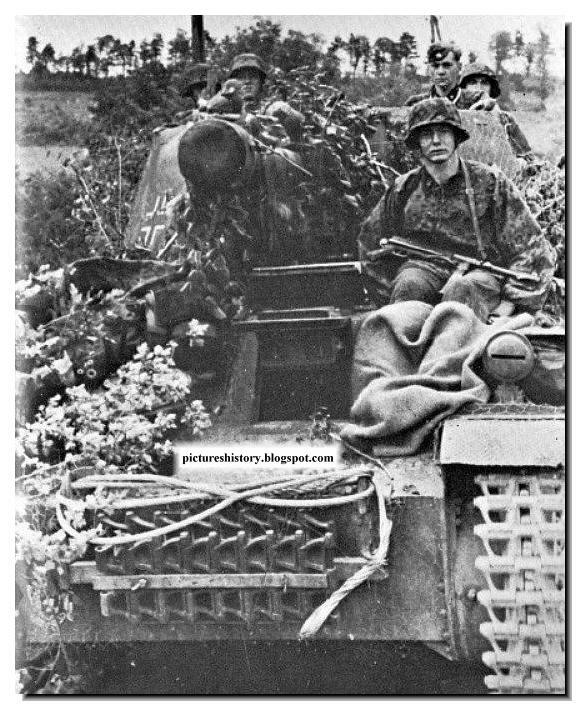 This was mainly due to the tactics of Hausser but make no mistake, Totenkopf in 1943 were as good as any other Panzer Division in the German Army and better than a good many of them. Many of the other Waffen SS units you mentioned were formed towards the end of the 3rd Reich and were not of the same quality as the big 3. 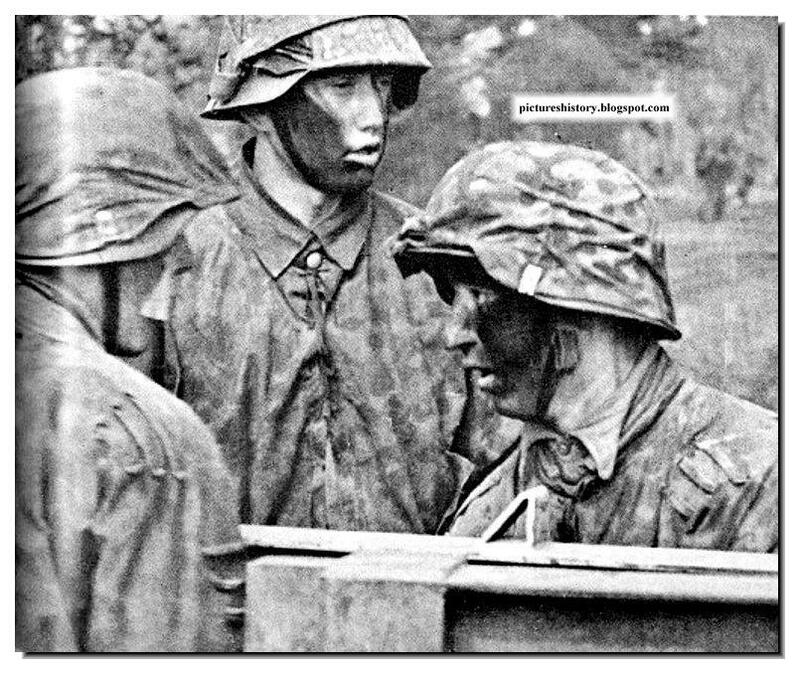 Hitlerjugend for example was formed by transferring a core of veteran NCO's from Liebstandarte to look after largely green troops, most of them Hitler Youth, hence the name. The Hitlerjugend did actually fight very well, but it was no elite formation. 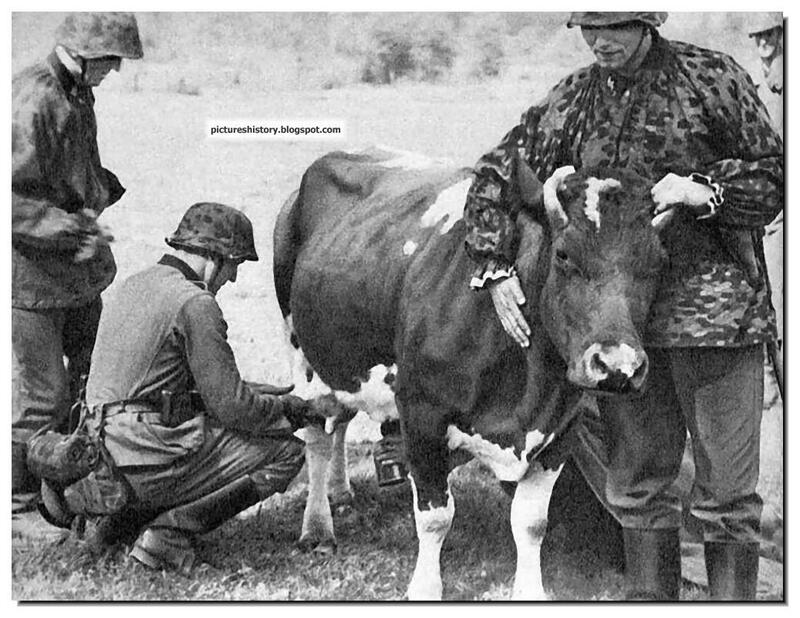 Milching a Dutch cow in 1940. Netherlands. 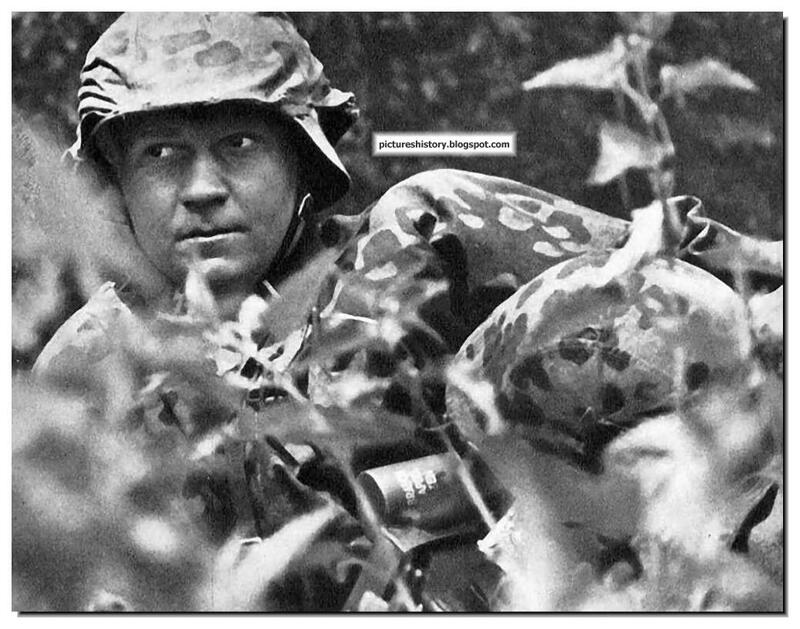 The elite esprit de corps so commonly found in the Waffen SS compared to other Wehrmacht units was as much a product of leadership as selection. 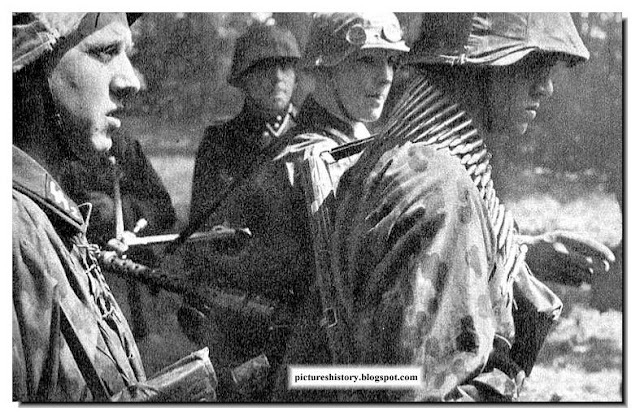 The relationship between officers and enlisted men in the Waffen SS differed greatly from the class separation found within the German Army. 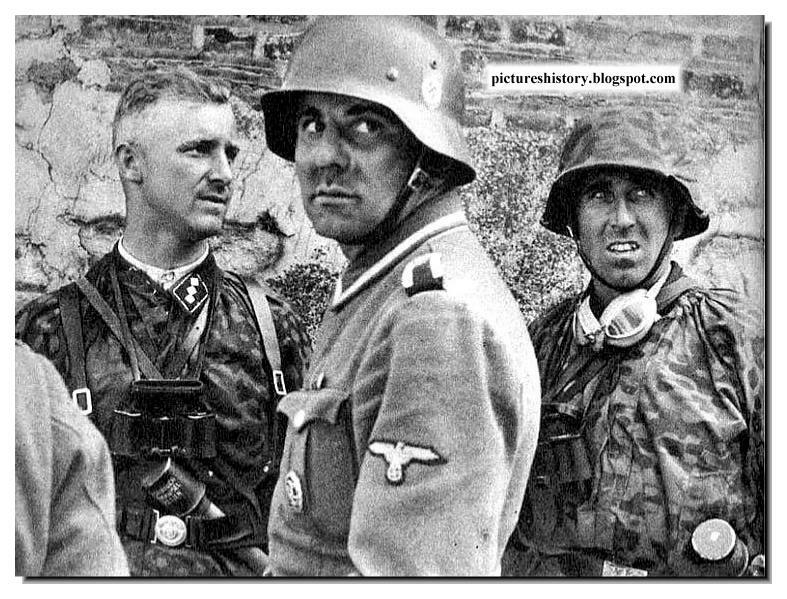 In the Wehrmacht, less than two percent of the officers were of ‘peasant stock', whereas 90% of the Waffen SS commanders had been brought up on the land. Waffen SS officers deliberately fostered a close relationship between themselves and their men. 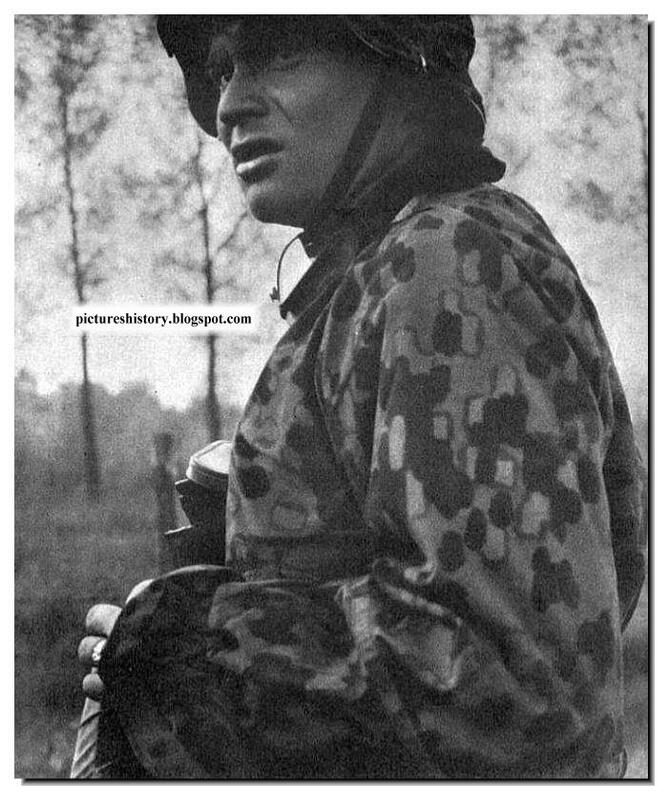 Expected to rise from the ranks, Waffen SS officers earned the respect and loyalty of their men by leading from the front and never asking them to do anything that they would not do themselves. 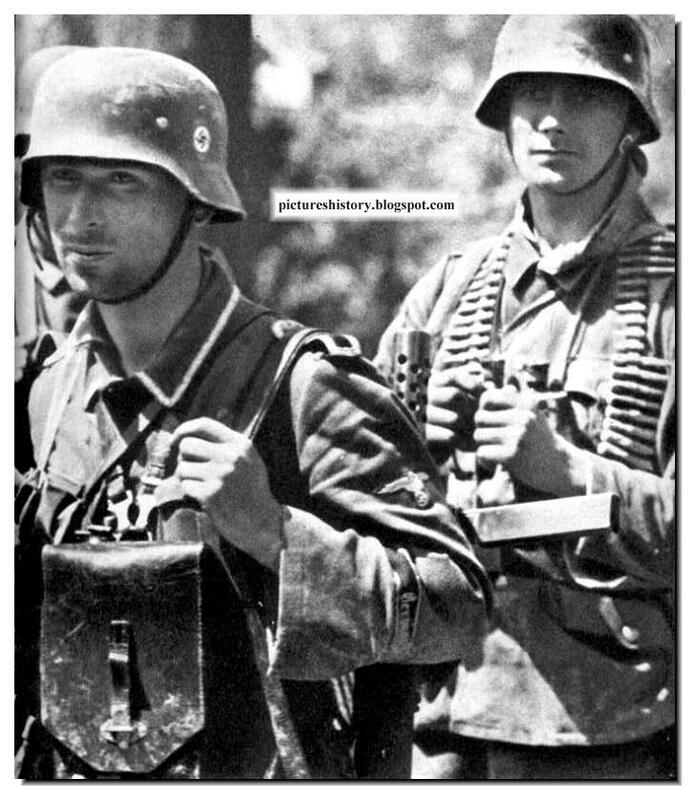 For many, this bond between brothers in arms was the most memorable aspect of serving as part of the Waffen SS. 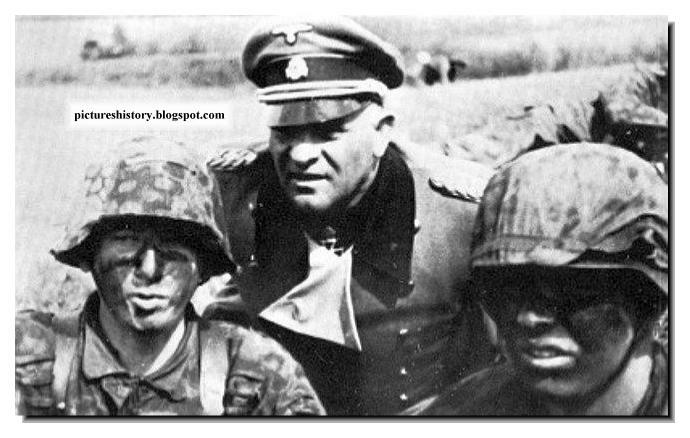 "My most enduring memory of the Waffen-SS", according to SS Veteran Gerd Rommel, "was the spirit with which we were all filled. We were all just around 18 years old, and our officers just 20 to 30 years old. Our Divisional commander, SS-Brigadefuhrer Heinz Harmel was then just 38 years old. The troops never addressed him as ‘Herr General', just as ‘Brigadefuhrer'. It was this spirit of equality which made us all feel so proud." The Karabiner 98 Kurz (often abbreviated Kar98k, K98, or K98k) was a bolt action rifle chambered for the 8x57mm IS/7.92×57mm IS cartridge that was adopted as the standard service rifle in 1935 by the German Wehrmacht. It was one of the final developments in the long line of Mauser military rifles. Although supplemented by semi- and fully automatic rifles during World War II, it remained the primary German service rifle until the end of World War II in 1945. For example, General Eberhard von Mackensen, commander of the IIIrd panzer Corps, wrote of the Leibstandarte, "Every division wishes it had the Leibstandarte as its neighbor. They are a genuine elite formation that I am happy and proud to have under my command." 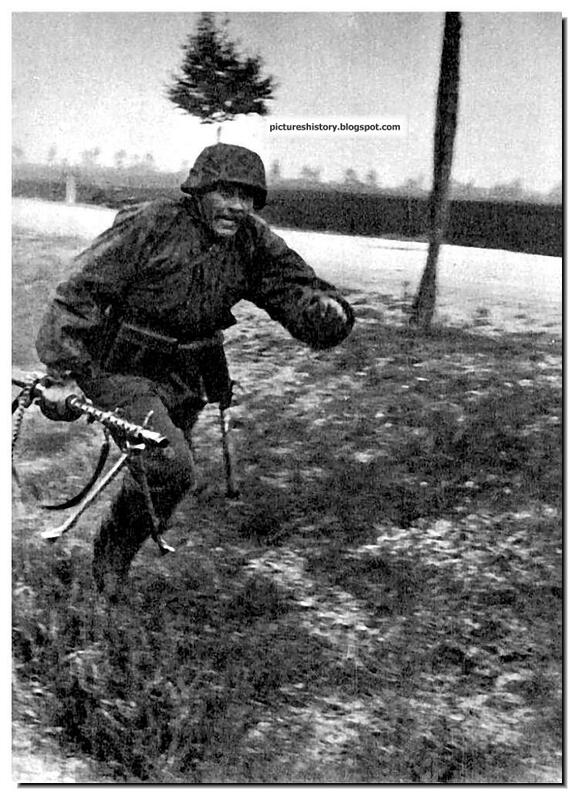 The Waffen SS divisions had indeed achieved the goals set by their Fuhrer. They had proven themselves in combat and gained the prestige and confidence of the German Army. In view of this, the Leibstandarte, the Totenkopfdivision, Wiking and the Das Reich were reorganized into panzer grenadier divisions, complete with tank battalions. Hitler also authorized the creation of more SS divisions and the SS Panzer Corps. As the tide began to turn against Hitler, with the fall of Stalingrad and the loss of North Africa, he placed a greater demand upon the men of the SS who where, "an extraordinary body of men, devoted to an idea, loyal unto death." 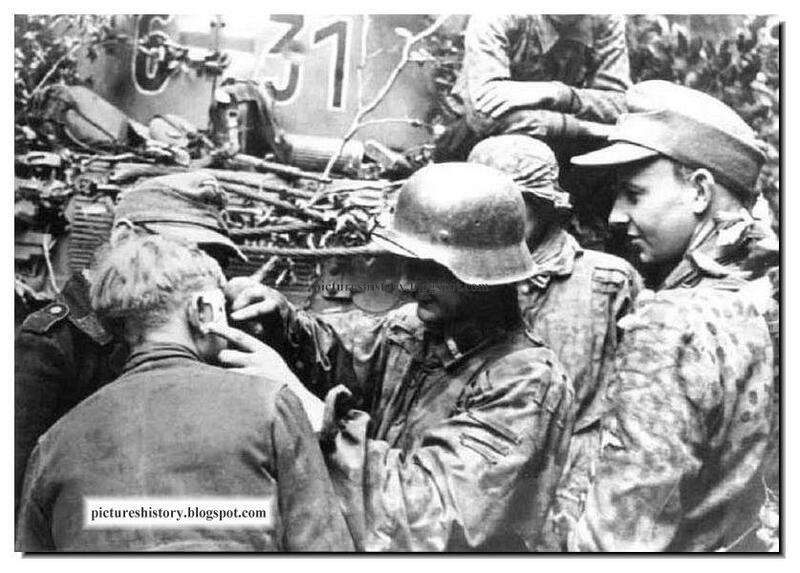 With the German defeat at Kursk, the Soviets gained the strategic initiative for good. 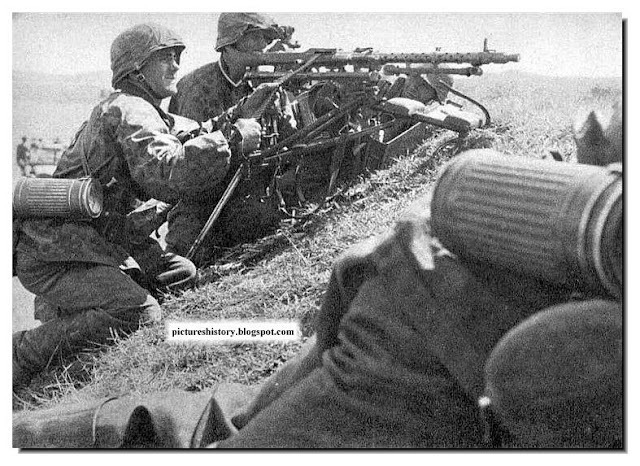 The subsequent Soviet offensive during the summer of 1943 proved devastating for the Wehrmacht . During the retreat, the SS formations became the "fire brigades" in the East. As motorized divisions, they were routinely rushed to the critical points on the front to seal a breach in the German lines or slow down the Soviet onslaught long enough for other formations to escape. 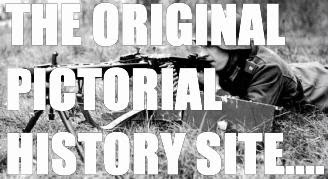 They had in the words of General Wohler, commander of the 8th Army, "stood like a rock in the Army, while the enemy broke through in neighboring sectors." 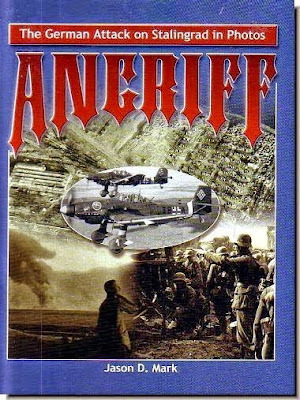 "The SS man's ability to remain calm in the face of disaster, his willingness to fight on against impossible odds, his lust for killing Russians, and most important, his readiness to perish rather than retreat and appear weaker than his racial enemy were all qualities that proved crucial throughout the war in retrieving hopeless situations; they became hallmarks of the Totenkopf divisions's performance wherever it fought." 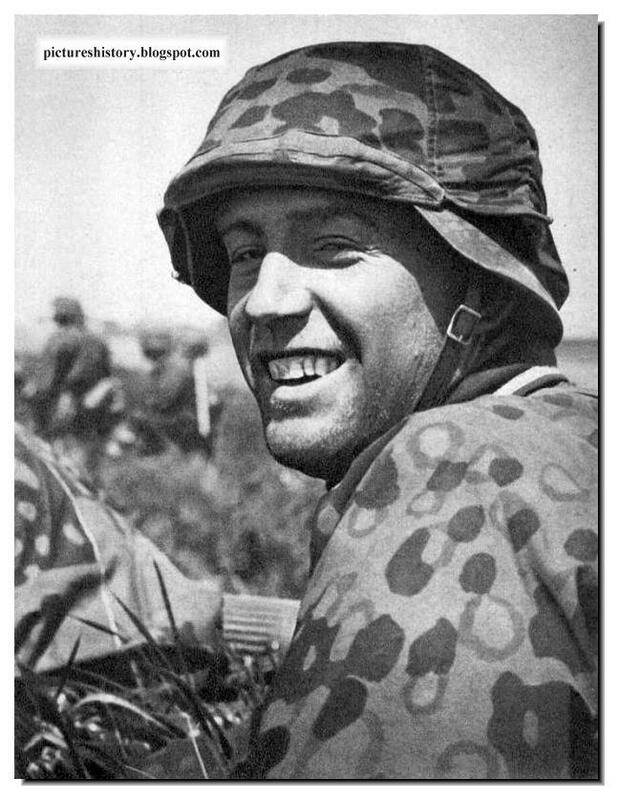 Karl Ullrich was awarded the Iron Cross 1st and 2nd class for bravery during the Battle of France, then transferred to the Totenkopf on the Eastern Front in 1941. He was awarded the Knight's Cross for his leadership and bravery during the battles of the Demyansk pocket in February 1942 and in October 1944 was given command of the 6th SS Panzer Grenadier Regiment Theodor Eicke and was awarded the Oakleaves while in command. Promoted to Standartenführer (Colonel) he was given command of the 5th SS Panzer Division Wiking for the final battles of the war in Hungary. A short time before the end of the war he was promoted to Oberführer and he surrendered to the Russians in May 1945. 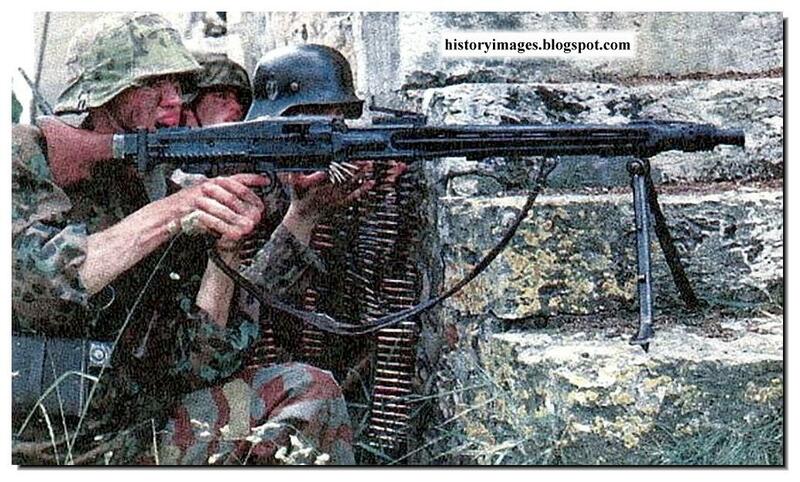 These guys are from the Hitler Youth (HitlerJugend) Division. One of them tends to a comrade. 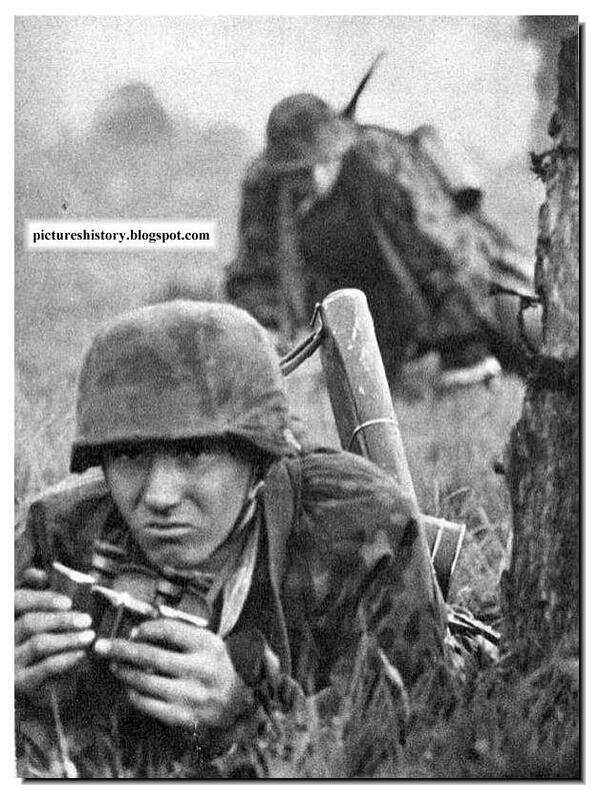 The Waffen SS divisions were once again nearly bled white during these terrible battles. They were unable to stop the advancing tide of the Allies overwhelming personnel and materiel superiority. What they did accomplish was to significantly delay the Allied advance. 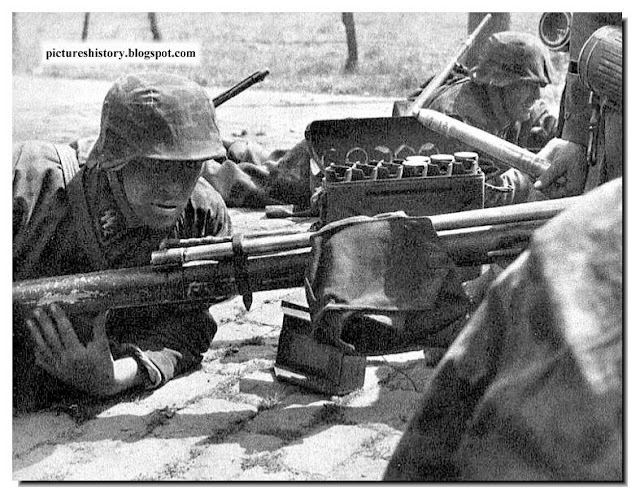 It is doubtful that the German defenses in France would have held as long as they did without the courage, determination, and overall combat power of the Waffen SS divisions. General Eisenhower remarked that, "while the SS elements as usual fought to annihilation, the ordinary German infantry gave themselves up in ever-increasing numbers." This reckless fanaticism in the face of defeat was exactly what Hitler needed from the troops who were to execute his planned counter offensive in the West. This SS man smilingly poses for the camera. In describing the Ardennes offensive, one grenadier remarked that, "Three years ago we would probably have stormed forward during the night in order not to allow the enemy any time to recover. But now after nearly five years of savage fighting things move much more slowly . . . The men are all right but tanks and guns need fuel and shells and it does not matter how much fighting spirit there is, without those two things nothing much can be achieved." Three other members of the Assault Battalion Charlemagne would receive the Knight's Cross, on the evening of April 29. By this time, 108 Soviet tanks had been destroyed in the city's center; 62 of them by Charlemagne soldiers. These French survivors spent April 30 repelling flame-throwing Soviet tanks, which kept lumbering toward the Führer Bunker. Adolf Hitler may have been surprised to learn that not all of his last personal defenders were Germans. 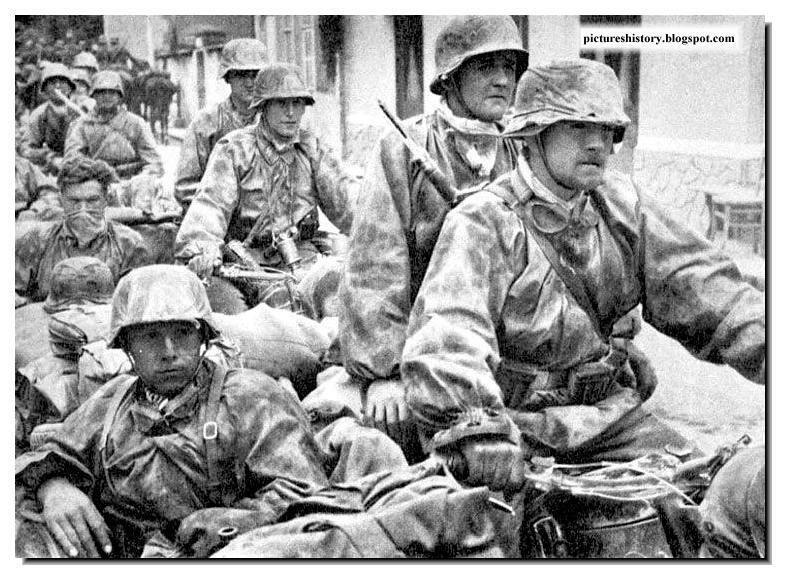 In addition to the Frenchmen, a few Danes, Norwegians, Latvians, Swedes, Spaniards and Balkan ethnic Germans, along with Hitler Youth, policemen and middle aged to elderly Volkssturm (People's Militia) were among those who fatefully joined in the final scenes of bravery and pathos. 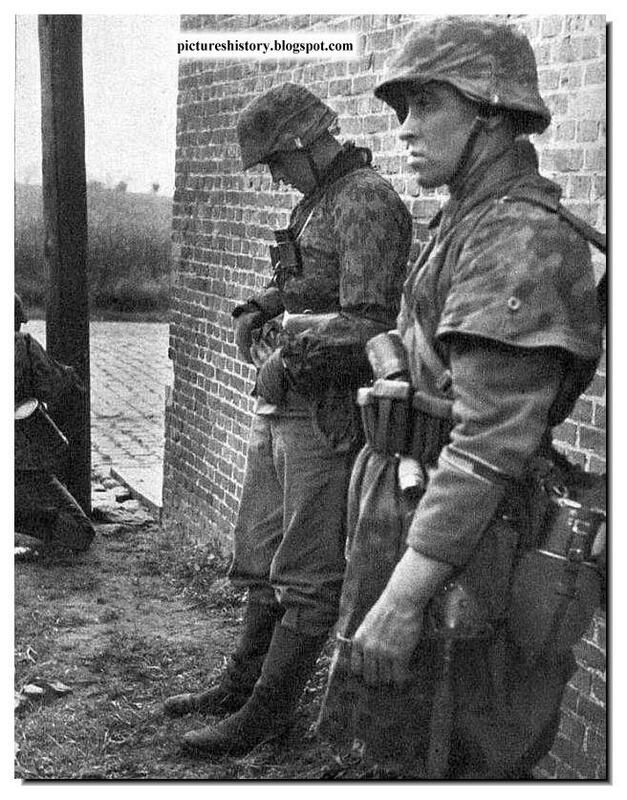 To the north of Berlin, SS Battalion 58 and other Charlemagne troopers who had not gone into the city conducted a fighting withdrawal to Schleswig-Holstein. Their objective was to reach Denmark and link up with the remains of Leon Degrelle's 28th SS Division Wallonien. But the British Army got in the way, and on May 2 the last Charlemagne commander, Stubaf. Boudet-Gheusi, attempted to surrender his command. Under a white flag, Boudet-Gheusi and his adjutant, (2nd Lieutenant) Radici crossed the Allied lines to speak with a British officer. The officer flatly rejected any official surrender, stating that the Frenchmen had to be turned over to the Russians for "punishment." 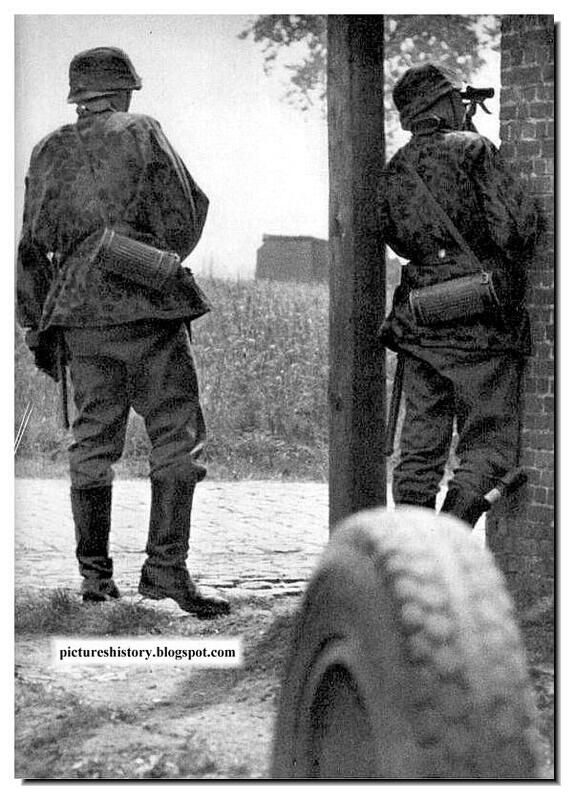 At that point the two French SS junior officers were disarmed and taken into custody. They were then placed on an armored personnel carrier and driven to the Soviet lines. Both managed to jump off en route and escape. Subsequently, Boudet-Gheusi would be forced to serve a long prison sentence in France. Radici was executed by France's postwar government. 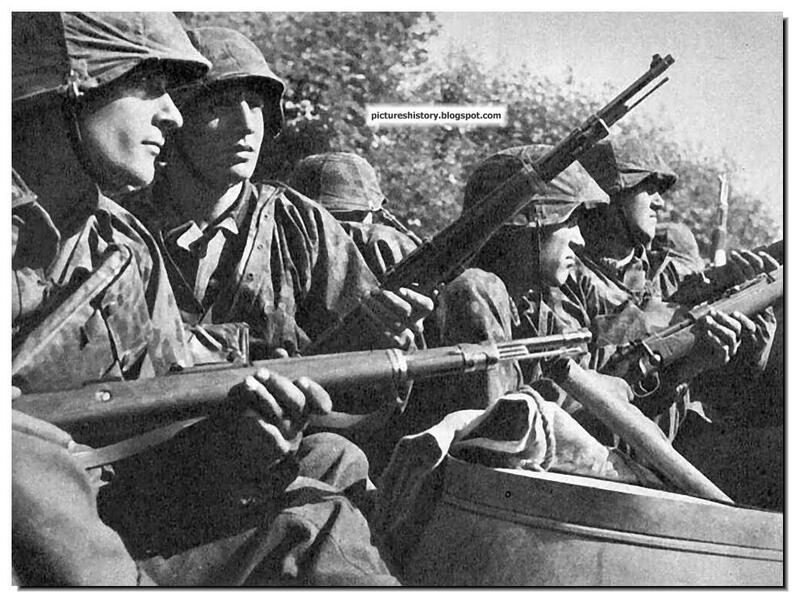 Part of the Charlemagne Wildflecken Regiment had been incorporated into the new SS-Panzergrenadier Division "Nibelungen" in Bavaria. This division had been formed late in the war from all sorts of available personnel. 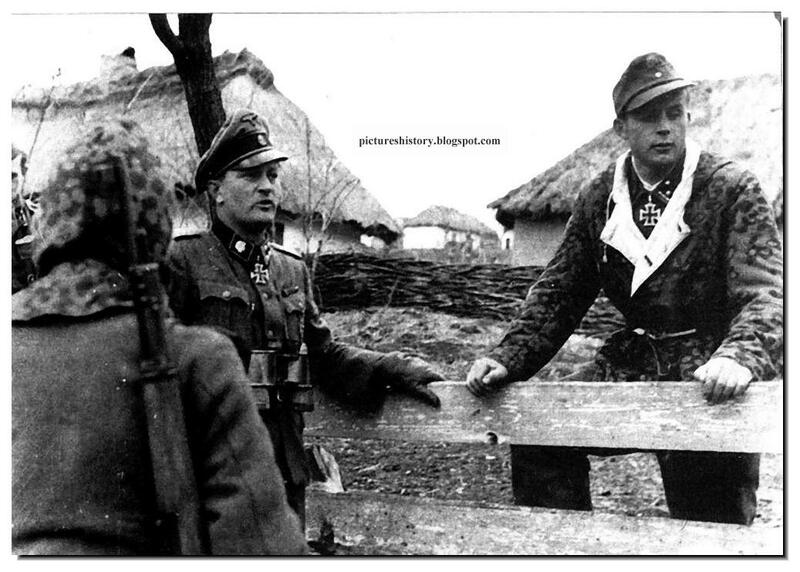 There were many French SS officer candidates and other European volunteers in its ranks. 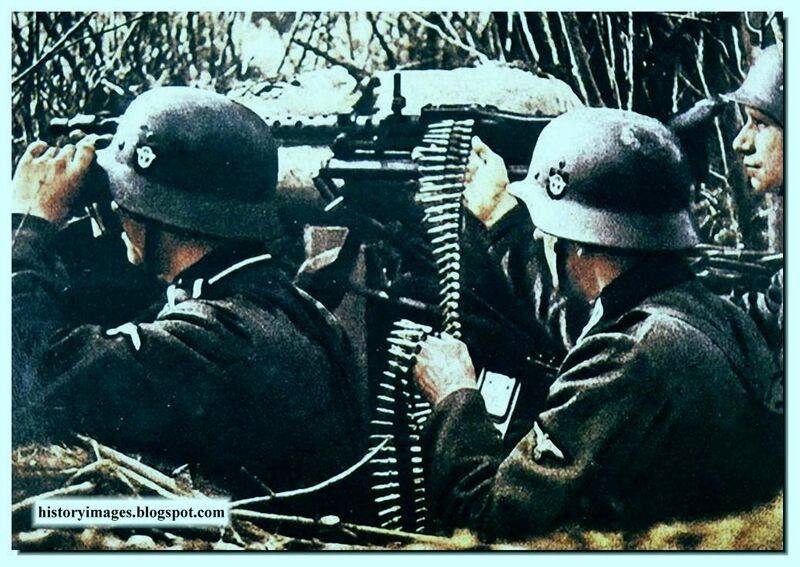 These were probably the only French SS troops to fight against the western Allies; in late April and early May, 1945. The Nibelungen Division surrendered to the Americans on May 9, two days after Germany's unconditional surrender at Reims, France. 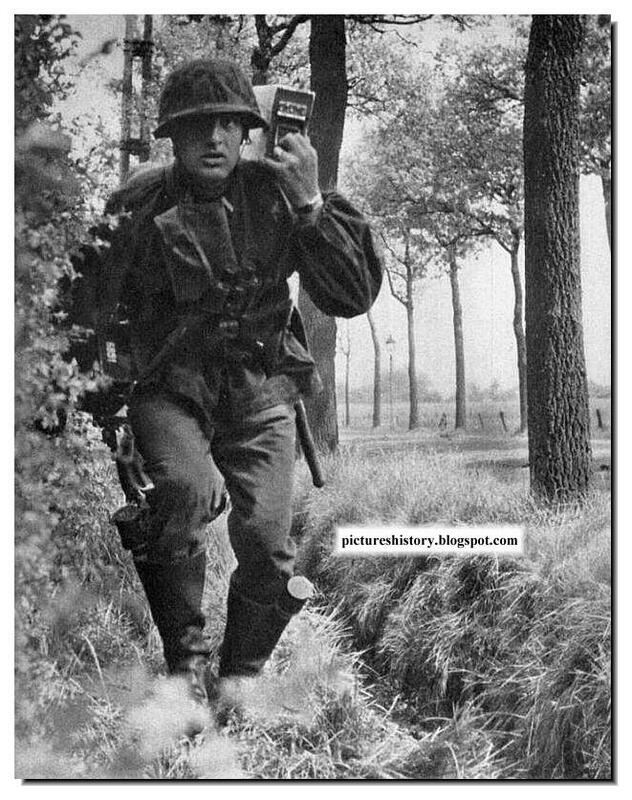 One would think this a much more preferable alternative for Waffen-SS volunteers than capitulation to the Red Army. But such was not necessarily the case. The Nibelungen POWs were severely abused by their captors. Many were beaten and even murdered in captivity. The bulk of the Nibelungen survivors would go into the cruel and infamous "open air" POW camps described in detail in James Bacque's book Other Losses. They definitely were not treated according to the rules of the Geneva Convention. The soldiers of the Charlemagne Division had marched into history. Of the more than 10,000 French volunteers in the Waffen-SS, more than half had been killed or missing at the front, or would die in captivity. Like tens of thousands of their European SS comrades, the French volunteers were drawn from all walks of life, from laborers to aristocrats. They strongly believed they were fighting for the preservation of European civilization, national integrity and the destruction of Communism. They literally fought to the last bullet, with few survivors having any regret about the course they took. 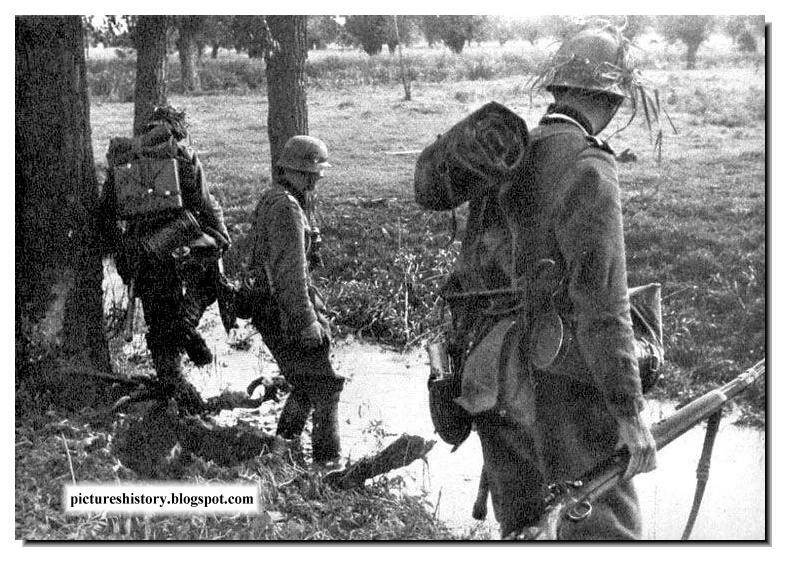 Waffen SS soldiers in France, 1940 gingerly try and cross the small stream. 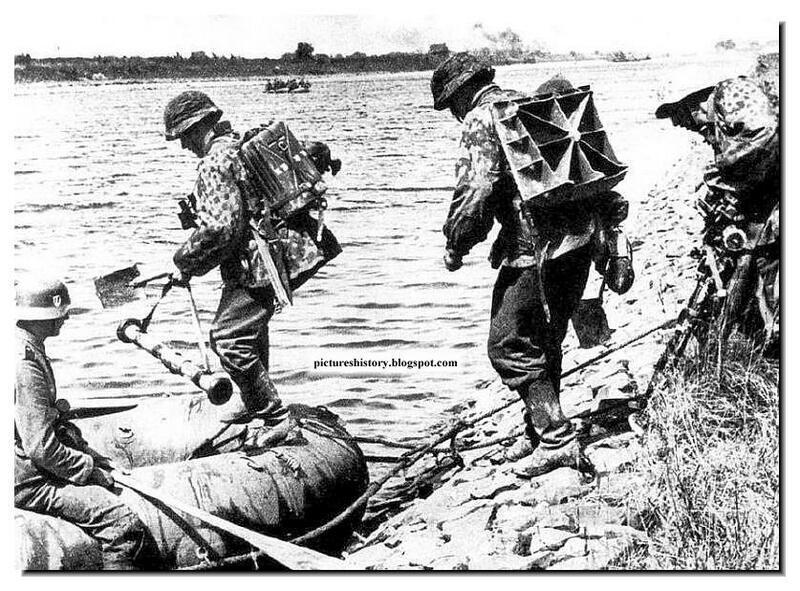 Allied casualties were generally much higher whenever they were thrown into combat opposite seasoned SS troops. Consequently the SS were both feared and admired for their military prowess. The allies feared that the SS would continue to offer armed underground resistance to the occupational authorities, therefore they determined to thoroughly disband and discredit this able military force before the eyes of not only the world, but of the German people as well. Consequently, the members of the SS received the most brutal treatment at the hands of the allied forces. Often accused of war crimes and crimes against humanity, the allies sought to expunge the very memory of this elite Nazi formation. 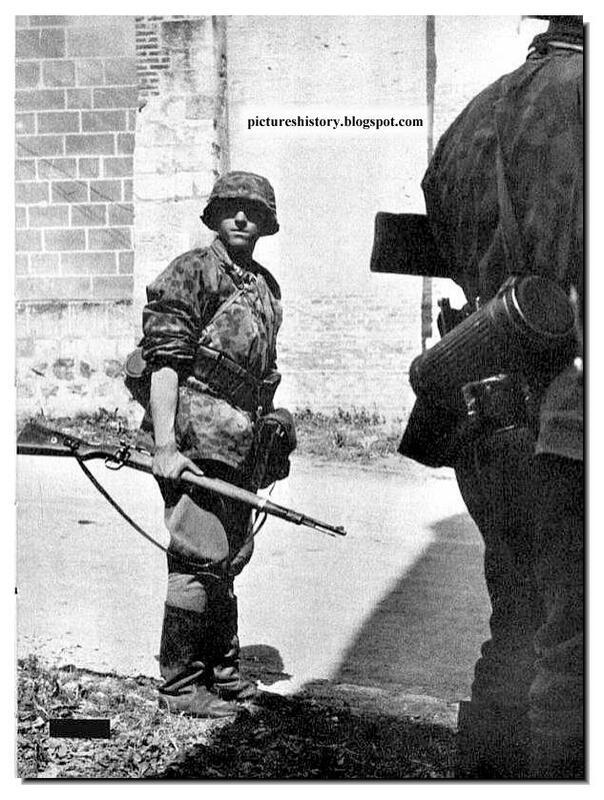 The truth of the matter is that the Waffen SS was no more criminal than any other fighting unit, allied OR axis, and the treatment it’s members received at the hands of the allies was unjust and often criminal. Since SS members were stationed at concentration camps as guards, the allies took advantage of this fact and used it to condemn the members of the SS as a whole. Of course it should go without saying that simply because someone was a guard at a camp does not mean he or she was a criminal. Western Front. 1940. Peer cautiously round a corner. 1940. Western Front. SS men on motorcycles wait for orders.